Most old sayings are still true today. This one is not. Ninety percent of the big fish in the world are already gone and if global fishing trends continue, there will be no wild fish left by 2050. Increasing global demand for seafood is resulting in record levels of overfishing and related damage to marine ecosystems. Unrestrained and heavily subsidized commercial fishing is responding to this growth in demand, aided by devastatingly powerful technologies, negligent fisheries management and little government enforcement. Combined with the effects of climate change, this means that the world’s fishing stocks are reaching the “end of the line”, as another saying goes. However, a compelling award-winning documentary movie of the same name illustrates that this environmental catastrophe can be avoided, if we try. A global movement is underway to ensure sustainably managed fisheries, and you are invited to be part of it. Healthy wild fish populations are essential for diverse marine ecosystems and thriving oceans. Sustainable sea life is also a food security issue. Over 2.6 billion people in developing countries get more than 20% of their animal protein from fish. Complementing the work of other advocacy groups, like the Monterey Bay Aquarium in the US, the Marine Stewardship Council (MSC) emerged in 1997 to help fill a global void for international sustainability standards for fisheries. Now with a presence on five continents, the privately funded MSC runs an eco-labelling program that enables everyone across the supply-chain, including consumers, to make environmentally responsible choices with seafood. It does this by providing third-party certification to fisheries abiding by sustainability practices. Since setting up the MSC Japan office in 2007, local representative Kozo Ishii has been heavily promoting sustainable fishing by partnering with fisheries, processors, distributors and retailers. A life-long fish lover, Ishii graduated from Japan’s National Fisheries University, which aims to cultivate leaders for the fishing industry. Having adjusted to only eating sustainable seafood himself, he now encourages his compatriots to buy green. Consuming consciously requires looking out for MSC and other eco-labels on your supermarket shelves. However, if you don’t see such labels when shopping or dining out, handy pocket guides (based on where you live) and a question or two to the fishmonger or server can help you find out which species to avoid. “All stakeholders in the fishing business have a long-term interest in ensuring sustainable fishing. For retailers in particular, stable procurement of fish is very important,” explains Ishii. That is why more and more supermarket chains are working with the MSC to source and sell certified fish. Impressively, for 2007/2008, the number of companies using the MSC’s certification and the total number of MSC labelled products (as shown in graph below) have doubled. In Japan alone, the number of MSC-labelled products grew a massive 614% during the same period, according to the MSC annual report (PDF). In the absence of strong enough international enforcement, the MSC’s voluntary industry standards operate under strict principles to ensure sustainability of targeted species. They also try to ensure sustainability of other species, that might inadvertently be caught through “by-catch” — the fishing industry’s version of collateral damage. “If a fishery is putting a by-catch population at risk, then it won’t be certified,” explained Ishii. While progress is slowly being made, Ishii believes that those earning a living off fishing are caught in a survival net that is being pulled by both economic and environmental forces. “There are some fishermen that recognise the problem, but still keep catching fish under increasing financial pressures,” he laments. The MSC has been accused of being too close to the food industry, especially since the Unilever corporation is one of its founders. As we have seen via comments on previous Our World 2.0 stories, concerned citizens are grappling with the role that corporations should play in solving environmental problems — ones they are often accused of creating. Environmental organization Greenpeace does not endorse any fishery certification programmes. It has been critical of the MSC even though the MSC adheres to the UN Food and Agriculture Organisation (FAO) eco-labelling guidelines. In the absence of stricter regulation of our oceans, however, is there any alternative scheme that can be employed to promote sustainable fishing other than eco-labelling? The good point about eco-labelling is that it does bring the final decision to us, the consumers. When asked about other controversial issues like whaling, and aquaculture — where farmed fish are typically maintained in controlled conditions in small pens and fed resource-intensive diets — Ishii told us that neither were within the MSC’s mandate. There are controversial plans underway by the World Wildlife Fund to set up an aquaculture stewardship council modelled on the MSC. Critics claim that such a move does not “take into account the wishes of local communities” and will “legitimise environmentally and socially damaging forms of aquaculture”. We entered our conversation with Ishii expecting to find out about the difficulties of one man in a large country trying to convince profit-driven industry stakeholders to accept voluntary standards. From our interview we gained the impression that passionate fish-lovers, from retail managers to artists, are approaching the MSC voluntarily and starting their own initiatives to spread awareness. We noted that there are a range of educational tools, mainly directed towards children, that have picked up on the overfishing issue and the MSC’s work to help address it. In order to cut through to new audiences, activists are using forms of “edutainment” to promote serious environmental messages in clever and fun ways. 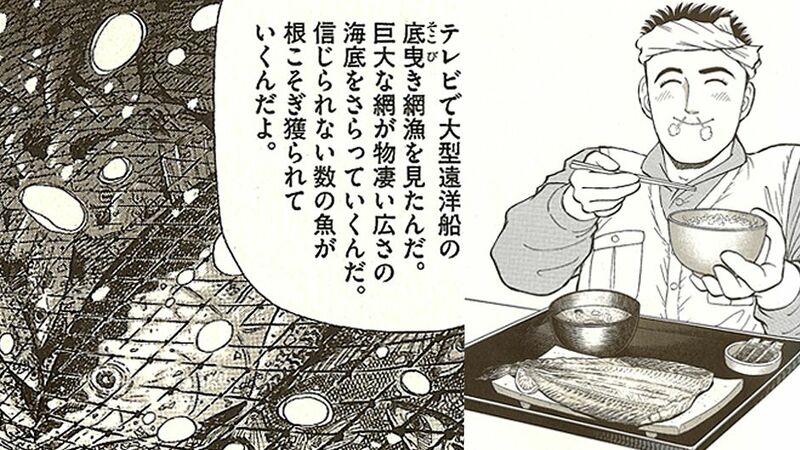 In one fascinating example, a producer of a manga comic has decided to tell a story about the MSC’s work in a volume entitled Tsukiji Uogashi Sandaime or Tsukiji Riverside Fish Market: Third Generation (pictured above). 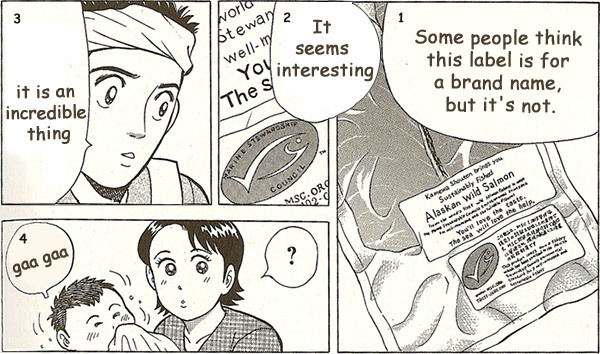 The story focuses on how people in the fishing industry in Japan become aware of the overfishing problem, and begin to fish sustainably and label their products accordingly. Ishii can’t. That is why his final message suggests that we should not wait for others to make the change. Consuming consciously is also one of the key messages for this year’s first World Oceans Day on 8 June. The day celebrates the connection of each person to the oceans. As we enjoy the culinary and lifestyle benefits the oceans provide, we also have the responsibility to ensure the oceans continue to live and breathe for future generations. Click here to find out what seafood is MSC certified in your country, and where you can buy it. If you are keen to learn more about the MSC, watch the video below. “Plenty of fish in the sea” by Mark Notaras is licensed under a Creative Commons Attribution-NonCommercial-ShareAlike 3.0 Unported License. This is a great thing that you’re doing. I couldn’t agree more about conserving our oceans and protecting the fish! I love to go fishing, but only for catch and release. I am very passionate about protecting our fish in addition to other aquatic life on our planet. I thought that plenty of fish exist in the sea. Actually Ninety percent of the big fish in the world are already gone and if global fishing trends continue, there will not be left by 2050. Increasing global demand for seafood is resulting in record levels of overfishing. For instance, the whale had been captured for the food resource, the fuel, and the industrial raw material. Moreover, the sturgeon was caught indiscriminately because it had dealings by high price. Healthy wild fish populations are essential for diverse marine ecosystems. Developing countries get more than 20% of their animal protein from fish. It is important that we buy the commodity that attaches MSC and other Eco labels. The number of products that are attached of the MSC label is 1,421 in the 2008. The number is increasing 614 during 07-08. I think that two things are necessary to solve this problem. First of all, do not do illegal capture. A world without fish is I can’t imagine. Therefore, we must continue to make an effort for the sake of the future. I think the way of solving this problem is consumers consider eco. as for this problem. We should improve education of environment. It’s not “global demand,” it’s too many people. The continual glossing over of the root environmental problem ensures that it won’t get fixed. Political correctness on the topic of human overpopulation isn’t helping anyone (or any species). Fisheries are just one of many problems tied to human overload of natural systems. Deforestation, water shortages and AGW are other obvious ones. If so many people weren’t consuming so much stuff, the system would have some slack to recover instead of existing on the rising crest of collapse. The best hope I see is that “Peak Oil” will continue to lower birthrates as people scale down their lives by necessity. Too bad most aren’t bright enough to do it voluntarily. I was at a business lunch awhile back where exotic fish were being ordered, and when I mentioned overfishing I got glassy-eyed looks and stupid jokes and remarks (“we’re supposed to feel guilty about just wanting to eat?”). What a dim bunch the human race is. It’s odd (but not surprising) that there’s no direct mention of human overpopulation in this article. It gets soft-peddled as “growth in demand,” which is a way of pretending that 80 million more people annually on a finite planet is magically sustainable. We can’t solve a fundamental carrying-capacity problem by continually mitigating it and ignoring the root cause. Nature is being micromanaged into oblivion for the sake of economic growthism and political correctness. There’s a supposed “right” of humans to crowd the world to death while other species get culled if they dare step outside their shrinking habitat. The current definition of “balance” is just more people consuming more resources while playing word games to pretend the resources aren’t actually shrinking. Birth control is the only technology that can truly restore human balance with nature, but it seems that too many jobs depend on environmental mitigation. People claim to want to preserve nature, but are engaged in a “management” racket that ensures it keeps getting diced into smaller pieces. Minced might be a better word in the case of fish. I think it’s disgusting people actually think catch and release is “protecting the enviroment.” If you actually cared about aquatic life you would not go fishing at all. Fish that is caught and then released most likely dies within a few days. People who release them are worse than people who eat them as you are wasteful whereas at least the bad people who ate them used them.